Sunset World Resorts & Vacation Experiences hotel chain started the celebration of its 25th anniversary operating in this destination by organizing the traditional King Cake party along with 150 elderly people, members of the “Club de los Años Dorados de la Tercera Edad”, the party was livened up with music and presents. This celebration is the first one in 2017, year in which Sunset World will perform many charitable actions framed by its 25th anniversary operating in the main tourist destination in Mexico and Latin America, where it was founded back in 1992. During the event, Annie Arroyo, Director of Brand and Communication of Sunset World, took part and gave presents to the members of the aforementioned elderly people association, which every December organizes a talent contest consisting in dancing, singing and poetry recital. 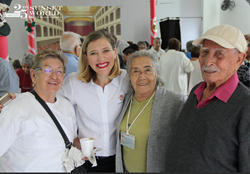 The goal of this association is to integrate and activate the elderly people into the society.